OUTREACH | Neil Lewis, Jr.
Part of what inspired me to become a social psychologist was learning about the various ways the field has worked on solving a variety of social ailments throughout history, beginning with our founder Kurt Lewin’s (1946) influential article “Action Research and Minority Problems.” I am committed to continuing the tradition in our field of not only doing rigorous, theoretically-driven research, but to also finding ways to use that research to give back and improve conditions in our society. The two social issues that bother me most are disparities in education and health, and so I spend most of my outreach efforts trying to tackle those issues. Below are some of the initiatives I have been involved with that are related to those issues, where I use social psychological insights to try to remedy disparities. The Preparation Initiative (PI) is a learning community designed to assist students from underprivileged backgrounds who, as a result of the limited resources of their high schools, enter the University of Michigan without many of the tools necessary to thrive in their courses, and on campus more generally. Our objective is to help these students gain admittance to the Ross School’s Bachelor of Business Administration program at the end of their freshman or sophomore year, and to help them excel while in the BBA program. We do this by providing students with coaches who work with them on improving their quantitative, writing, studying, and time management skills. In addition, we provide students with academic advisers and peer mentors who provide them with guidance throughout their academic journey. I initially got involved with the PI as a consultant, providing insights from social psychological research on how to improve students’ motivation. After that, I developed the writing coaching component of the PI to work on improving students’ writing skills. I then served as the program’s interim director for a year while faculty director Dr. J. Frank Yates was away on sabbatical leave. Currently I am an external advisor for the program. The Lansing SAVE initiative is a multi-level collaborative project led by practitioners, advocates, nonprofit organizations, institutions of higher education, local government, and school district officials. The goal of the initiative was to create a universal, automatic savings structure targeting youth residing in the city of Lansing in order to improve academic outcomes (for theoretical rationale, see Oyserman, 2013, Econ Educ Rev), increase access to the financial mainstream, and asset building for Lansing’s future generations. 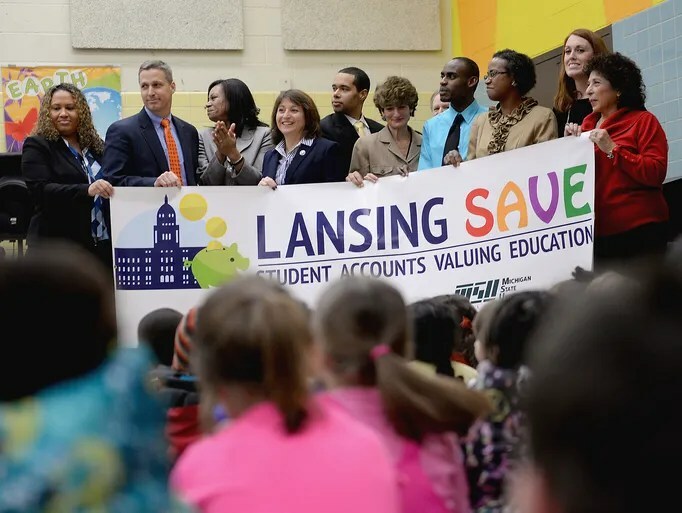 In addition, the Lansing SAVE initiative aimed to create a common model for Child Savings Accounts initiatives that has the potential to be implemented in any Michigan community, with the goal of creating a foundation for eventual statewide policy, disseminating the model to all Michigan youth. I was heavily involved in the development and launch of the program, and chaired the classroom intervention and curriculum working group from 2013 to 2015. I still periodically consult with the program administrators, but day-to-day operations are now managed by the Lansing School District and City of Lansing.